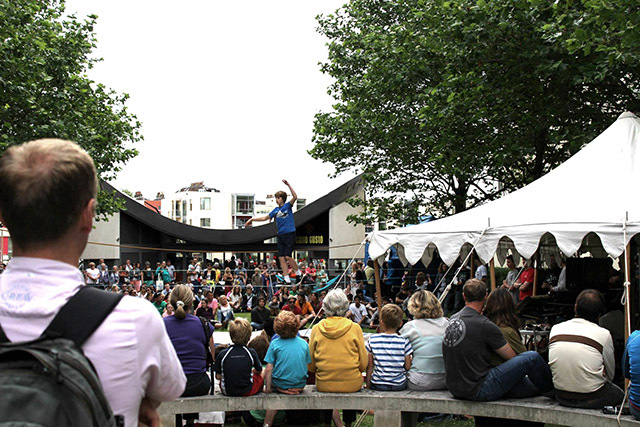 The Bristol Slackline Jam 2015 has done it once again. 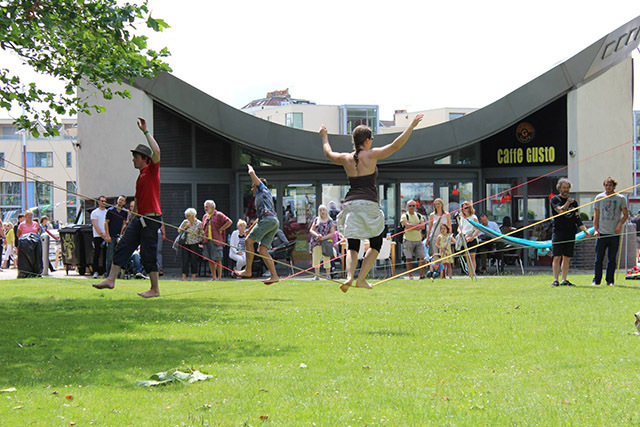 In its second year as part of the Bristol Harbour Festival the slackline jam, sponsored by Maverick Slacklines and Cirque Bijou, and organised by Jacob Hi-Ho, brought the full force of the UK slackline community to Cathedral Walk. The trickline competition on Saturday, with its palpable vibe of inclusiveness and free-form ‘rule’ breaking and making, unique to UK events, was enjoyed by hundreds of festival goers. Hundreds more also had the opportunity to see some of the finest tricks and stunts by the cream of the UK crop during demos on College Green on the circus stage. In true UK slack. fest. style, Sunday encompassed creativity at its core. A brand new competition never seen before, demonstrating the versatility of the sport. 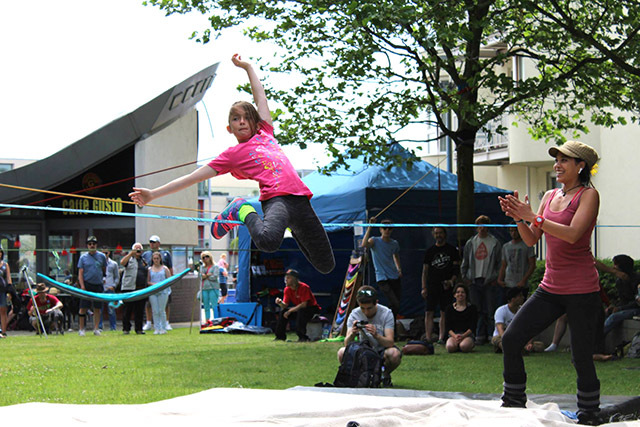 Slackliners went head to head, much like any other slackline comp, but this time were allowed to choose between a selection of different lines in order to show off their own skill base and win one over on their competitor in a myriad of ways. Lines were rigged for static tricks, dynamic tricklining, surfing, swinging, hopstepping, or anything else the competitors chose to use them for. The real challenge was how to judge it. 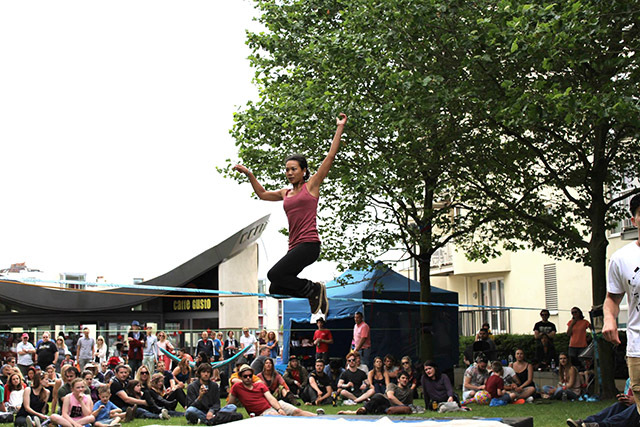 With the judging, as always, being carried out by the competitors themselves, it gave a great opportunity to compare different styles and levels of technical difficulty between different disciplines of slacklining – quite possibly an impossible task! 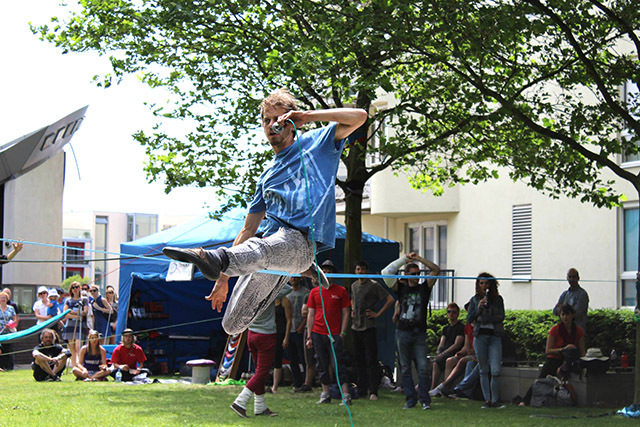 It was an educational process for participants and audience alike, and was a real showcase of the different ways slacklining can be enjoyed and the different directions it can be taken. All in all, the event proved to be a huge success and yet another chance for people involved in this sport to share their love for it with each other and the general public. Asides from sponsorship from the original UK slackline company, Maverick, and the invite from Cirque Bijou and The Bristol Harbour Festival, this event would not have been half the success it was without the invaluable input from Brian and Boom of Effootless Slacklines, Fergie and Casey with the beautifully sounding and looking Suitcase Sound System, and help and support in the right place at the right time from members of the community.